My recent repost of an article on Columbus, Ohio’s brand blew away the all time comment record for this blog, with 271 as of this writing. One the discussions was around the extent to which Columbus and other Ohio cities draw mostly from the state or from a broader area. Obviously with Ohio State University, Columbus has a massive in-state draw. But what about people from out of state? As expected, Columbus has a huge in-state draw. 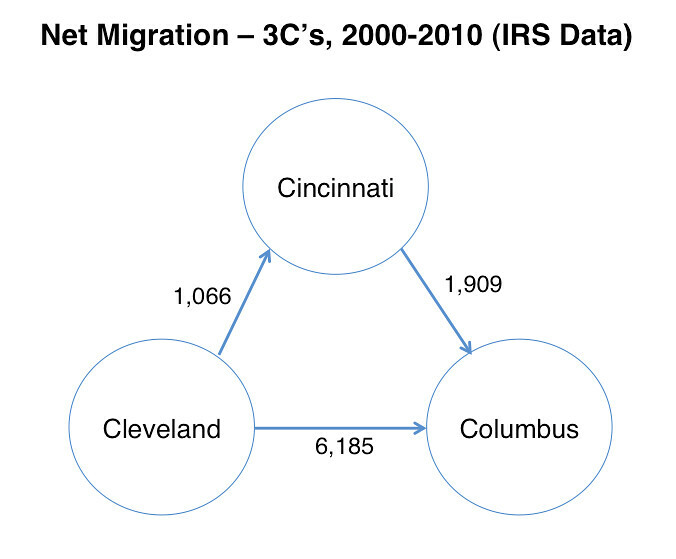 But what surprised me is that Columbus actually has negative migration with the rest of the country. In effect, Columbus gains people from Ohio and exports them to the rest of the country. I’m sure the university has something to do with this, but it’s interesting nevertheless. Cincinnati shows the same pattern, only at a smaller scale. And Cleveland is bleeding people both to Ohio and the rest of the country. Keep in mind with Cleveland that a lot of the in-state outmigration is probably in effect suburban because of the nature of the way Northeast Ohio metros are set up. This was a shocker to me. Look at Nashville and Charlotte. It’s not so much that they have large net migration from out of state, but that they have very low net migration from inside. Though Nashville is the boomtown of Tennessee, it seems not to be sucking in people from the rest of the state. Portland is also an interesting case. It appears to be like Nashville and Charlotte, but what this doesn’t show is that overwhelmingly the net migration to Portland is coming from California – 53,000 people worth. If you exclude both Oregon and California, Portland only drew a net of 21,000 people from the rest of the country. Contrary to what you might think, vast quantities of people (on a net basis) are not streaming into Portland from all over the country. It’s a regional draw. Austin parallels Columbus a bit in that it has a huge in-state draw, possibly again because of the university. It also as a huge migration with California – 30,000 people. If you look at Texas plus California, that’s about half the total. 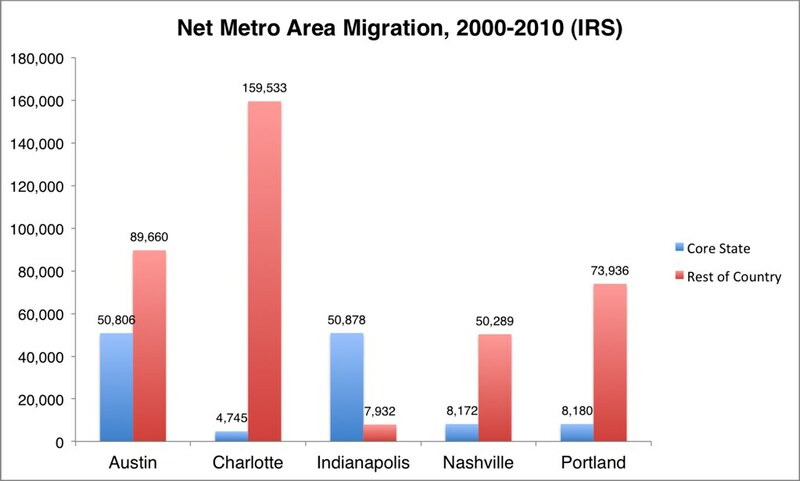 Charlotte has a similar effect with New York and New Jersey migration. Indianapolis is sort of a control with Columbus. It is primarily an in-state draw but does have a positive balance with the rest of the country. Keep in mind that it will inevitably lose some people to Sunbelt states for retirement. There’s not much you can do about that. But it’s an effect say North Carolina may have less of. The contrast with Columbus in out of state migration could be due to the lack of a major school there. I don’t know for sure. There’s no radical difference. 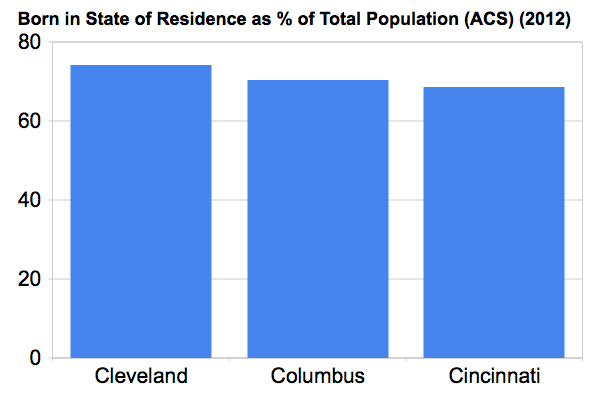 In fact, by my eyeball calculation, the difference between Columbus and Cleveland is almost entirely due to the former’s higher percentage of foreign born residents (again, partially an artifact of OSU). In their domestic population they are similar. Cincinnati is in the corner of the state and a three state metro. It’s easy to see that its born in state of residence figure is lower because of people who crossed a state line while not leaving the region, though I can’t quantify the exact figures. The numbers above raise the question of whether or not Columbus is just a lot more attractive than its overall metro area. That would explain why about half of all population growth is in Franklin County, and why the entire metro would lose domestically but Columbus is improving those numbers. Jon, so much of Franklin County is suburban in nature that even the core county data doesn’t prove anything about whether “urban Columbus” is more attractive to incoming residents than its suburban subdivisions. There’s just a lot of Columbus and Franklin County in that 6-10 miles from downtown suburban ring, which is probably where most of the growth is occurring. Chris, from 2011-2012, Franklin County gained over 16,000 people. About 11,000 of that total was growth within the city of Columbus. Now, you can just assume that it was all in suburban Columbus, but I’m not sure why suburban Columbus would see so much of that growth, but less than 1/3rd would occur within all the other dozen or so separate suburbs in the county, especially fast-growing Dublin, New Albany, etc. It’s also of note that in 2012, Franklin County became the fastest-growing in the state, beating out suburban Delaware County for the first time in many years. As far as proving where that growth is occurring, based on maps I’ve done, a lot of strongest housing value gains have occurred along and near High Street from Merion Village on up through Worthington, as well as the streetcar suburbs of Grandview, Bexley and a few others. That might provide a clue on where demand is right now. Also, we were talking about metro migration rates. I just wanted to break it down a bit more to see how Franklin County was performing, considering it’s Columbus’ home county. It seems to be doing much better than the metro overall. Population growth by definition has to occur where new housing is built, and the vast majority of new housing in any metro is suburban. If urban Columbus has an EXCEPTIONALLY BUSY downtown apartment-building market, maybe 15-25% of those folks moved into the “old city” (downtown and near downtown). Otherwise the only “new” places to move were new suburban subdivisions 6-10 miles away from downtown. Again…Marion County is 20% smaller than Franklin County, so its suburban population gains are necessarily lower than Franklin County as it approaches “built out”. This remains a tangerine-orange comparison. Similar, but not the same. One’s bigger. Prices in desirable built-out and landlocked neighborhoods in every city rise. Indianapolis’ streetcar-suburban Meridian Kessler and Irvington, as well as Meridian Hills and Williams Creek (where Peyton Manning lived) are similar examples because there’s no new supply of building lots. I am most familiar with Meridian Kessler (Indy) and Bexley (Cbus), having lived in both. Meridian Kessler is very similar to Bexley in size, housing stock, age, and demographics, except it has Indianapolis schools. Houses are some of the most expensive on a per-square-foot basis in the region, Indy’s average is probably $80-100/sf and MK is double that…for houses 80-110 years old. Grandview and Bexley are not indicative of any Franklin County population increase. They are built out and landlocked, and Bexley’s population has been stagnant for several decades. Slight localized increases in density (some condos and apartments along Main Street in Bexley) don’t even balance the average household size decline. My point is, highly desirable neighborhoods or enclaves like Bexley don’t really tell you about demand for the city or metro at large. Delaware County is pretty far out there; Delaware (county seat) is exurban, nearly 30 miles from Downtown Columbus via expressway. In the crisis, exurban growth everywhere slowed while downtown apartments picked up. This is an unsurprising result given that Millennials are now the largest cohort in the US and they are getting apartments, though as they age, apartment living will prove a bit less attractive. It’s easy to live in apartments when you don’t have much stuff and don’t spend a lot of time at home, but once you have kids and cribs and carseats and diaper bags, that changes. There was an interesting piece in New Geography the other day, listing the percentage of population 0-14 in various large metros. Indy was highest in the Midwest, behind Salt Lake and a gaggle of sunbelt cities. Those are the people most likely to settle in any metro as adults, so the trends look fairly favorable 10 years out. You’re doing well, Chris. Keep on fighting. Franklin County, even with all those tOSU students stacked into a small area, has lower density than Marion County, by about 5%. Both are pretty low density anyway. This gets at “more suburbs are inside” Franklin County. Cook County, IL has density more than double Marion County. THAT is unquestionably more urban than any of the rest. But everyone already knows that. The point is, by most tangible measures, Columbus is just not demonstrably “more urban” than Indianapolis…city, core county, or metro. It’s pretty much the same, better in some aspects and worse in others. Chris, there was a census report, I believe, that came out last year that listed cities in which were seeing higher growth than their suburbs. Not that many cities nationally were doing so, but Columbus was one of them. The urban core vacancy rates for apartments has been reported several times in the last year or two in the 1-3% range. Apartment units under construction tripled between 2011 and 2013, from less than 700 to over 2,000, and looks to double again over the next few years. Meanwhile, in the overall Columbus area, the housing market is building at the lowest rate since the early 2000s (less than half) and the supply is at its lowest in at least a decade. The suburbs are still building, but nowhere near where they were, but the urban market is at its fastest pace in many years, if not decades. 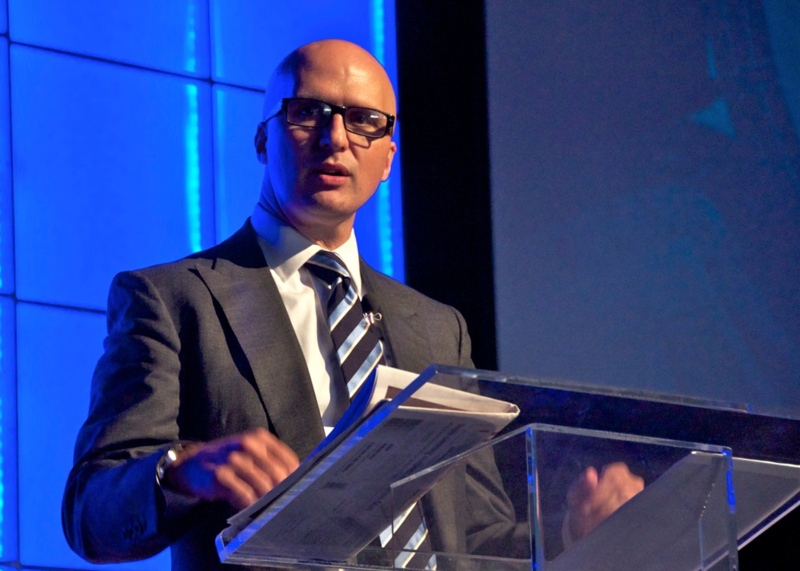 A few stories have come out recently as well about how Columbus’ development patterns are changing. Here’s one: http://switchboard.nrdc.org/blogs/dlovaas/discovering_a_new_housing_futu.html It suggests that the city is ripe for a LOT of infill over the next 20-30 years, and if so, what we’re seeing with the apartment boom is just the beginning. In any case, why would people only be moving to “new” places? Or only apartments in the urban core? There are plenty of houses within the urban core of Columbus that are nothing close to being new. Marion County is Indianapolis, by and large. Franklin County is not Columbus. Columbus is within it, so actually, the size difference is the opposite of what you suggest. In fact, Columbus is MUCH smaller in area size than Indy is. I only compared Marion with Franklin to compare how much of the metro growth was going into those core counties, not to directly compare city sizes (they’re not even close). No, they don’t always rise. Urban neighborhoods can just as easily decline in price as suburban. In fact, it’s probably even more likely that they do. What I mapped was the home value % change from 2000-2010 for every census tract in Franklin County. The most consistent and usually the highest % changes were along and near High Street. Only a handful of suburban areas saw the same. Most saw average improvement, if were not stagnant. If I ran those same numbers for the previous decade or two, the picture would likely be very different. Bexley actually saw a slight population loss 2000-2010, but estimates since then show growth. Whether or not that is true, we’ll have to wait a few more years. Grandview was another that saw a slight loss, but the amount of new residential construction there (all of which has been occurring since 2010) logically would suggest that doesn’t happen again. Same with Downtown or many neighborhoods nearby, such as East Franklinton, which is seeing a mini boom of sorts. I ran long-term population trends for every census tract as well. The urban core has been improving since at least 1990 (it reached bottom in about 1980), and should see its best years this decade since the 1940s. So no, Bexley alone won’t tell you trends for the entire metro or entire city, but there is plenty of other evidence that does. Ironically, Indy doesn’t seem to really be sharing in that urban development boom that you say cities are seeing now. 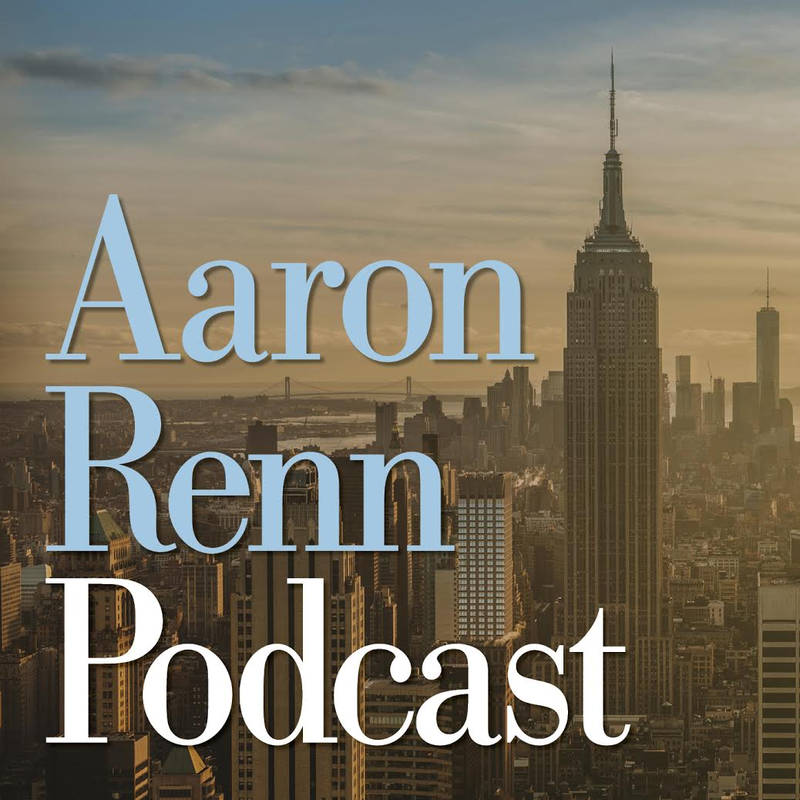 Aaron has already written about it. Its boom, by and large, still seems to be all about the suburbs. Chris, the actual difference between the two densities is about 90 ppsm, and Franklin County has been closing that gap every year given that it’s growing faster. In fact, it should be the more dense county before 2020. You can’t just look at a single moment in time and declare victory. You have to look at trends. Also, those counties are really not that bad. Of all metros nationally within their population range (1.5-2.5 million), both core counties rank in the top 5. But sure, if you’re comparing them to Chicago or NYC, they’re obviously going to look bad. If we’re talking about city… not even close. Columbus is MUCH more dense. Indy does not have a single tract with double-digit population density. Columbus has many. IMO, that does make the city, at least, demonstrably more urban, and trends are favorable for the county and metro. I think we all agree that Columbus was & still is a low density city- the point is it is closing the gap and changing in a way Indy doesn’t. I have no idea why you think that urban growth is passing Indy by. Indy has about 2-3,000 apartment units complete in the last year, under construction right now, and about to start downtown and near downtown. And again…in aggregate, more people move to Columbus than to Indianapolis because there are continuously new suburban developments within Columbus and Franklin County into which they can move. Don’t confuse individual move-in with aggregates. Sure, if I moved to Columbus, I could pick any house that’s for sale…but keep in mind that for an existing house, someone else moved out. Generally, in aggregate, the net gain for a city or region is all in new housing units (ignoring units that are taken out of service by obsolescence, and slight changes in residents per unit). Columbus can continue to annex bare land in Franklin, Delaware, Licking, Fairfield, Pickaway, Madison, and Union Counties to sponsor suburban growth and grab a high share of new metro population. 2-3000 apartments built downtown is a very small number, Cleveland already has passed 10,000 with a very low vacancy rate. Few large cities in the region have less residential growth downtown than Indy. You might have a case the Columbus ain’t so hot yet either. The reason I jump on here to deflate Indy a bit is that unlike Columbus it’s often held up as a model of ideal downtown development. The facts don’t come close to supporting that. Chris, these series of maps show why I think Columbus is doing much better from an urban standpoint. First, let’s look at % growth by tract 1990-2000. They’re relatively similar. In both cases, the areas around both immediate downtowns saw growth. Indy might have even been ahead a bit. But take a look at 2000-2010. Columbus’ urban growth clearly expanded quite a bit, while Indy’s clearly got worse. I have not done trends for Indy’s urban tracts, but as I’ve said, I have done them for Columbus’. That area of growth should expand even more come 2020. Indy may be turning things around, but it didn’t show that through a few years ago. Columbus already completed over 2000 units last year, not including those under construction or being planned. At least that many should wrap up this year, and perhaps 2x that many in 2015. You fail to remember that vacant housing could’ve been vacant for years. Take the Near East Side, for example, which includes Olde Towne East and King-Lincoln. Population there dropped from around 15,000 in 1950 to around 5,000 by 2010. That’s a lot of vacant properties. Tract #38, which is in OTE and hasn’t seen growth since at least the 1950s, will very likely be growing again by 2020, if it’s not already, given demographic changes. The housing doesn’t have to be new, but if people haven’t lived there in a long time, it may as well be. Finally, annexation into Columbus hasn’t been a huge factor in growth since the 1970s. The entirely of square miles annexed into Columbus the past 30 years is less than the total annexed just in that decade alone. The 2000s featured the slowest rate and smallest total in 70 years. Also, even if the city annexed a bunch of land today, it’s not annexing a lot of population because, as you say, that land is “bare”.